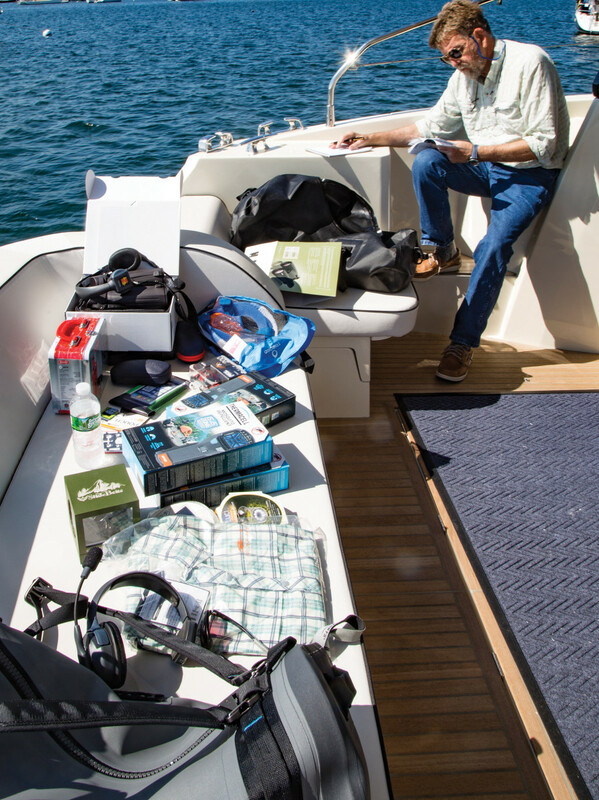 Executive Editor Bill Pike reviewing his notes on some of the gear ­arranged around the cockpit. 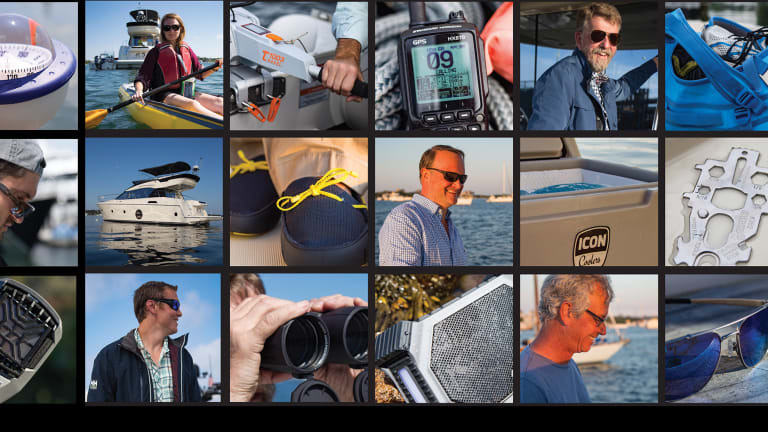 Almost everything you see in these pages was loaded up in an MC5 and taken to Block Island for testing. Yeti coolers are ridiculously good at retaining ice—the company knows it, we know it, the brand is built off that. Versatility, that’s a recent advancement. The Panga 50 is a robust dry bag that can protect your belongings from the elements, even full submersion (that was a fun one to test). 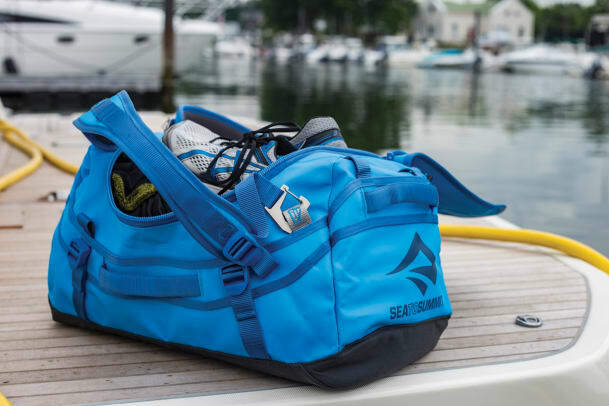 What we liked most were the versatile straps that allows you to carry your provisions to the dinghy with ease. 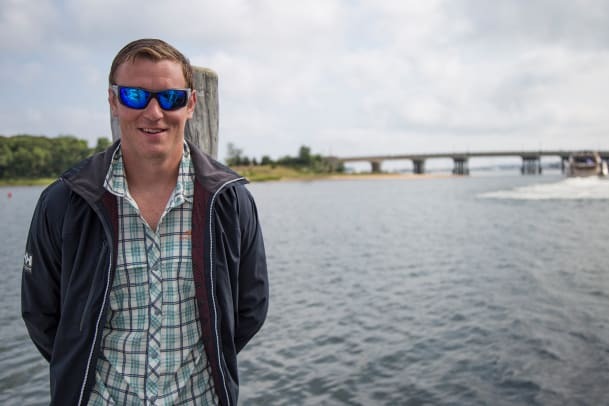 —Daniel Harding Jr.
How do you upgrade the classic Aviator? 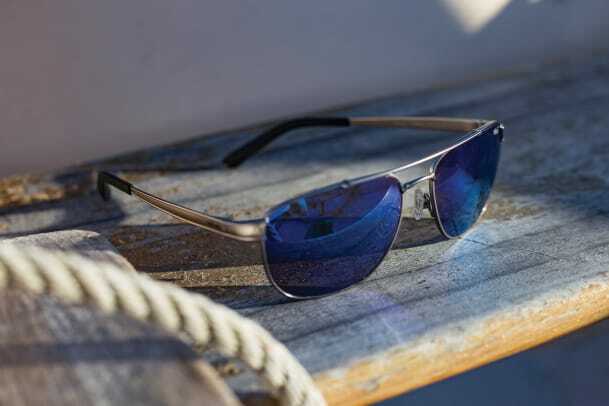 By adding scratch-resistant, crystal blue lenses that block dastardly UV rays while absorbing visible light. But these shades are seriously blue (if you couldn’t tell already). While this look isn’t for everyone, it gave Capt. Bill Pike pause for a second or two as he tried the Archers on for size. 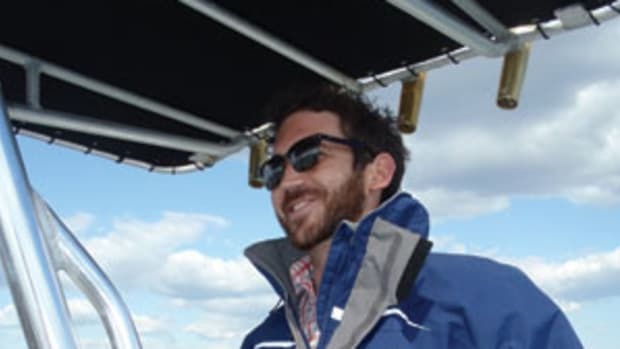 He went back to his own trusty Aviators, but he gives these glasses two thumbs up.—S.M. 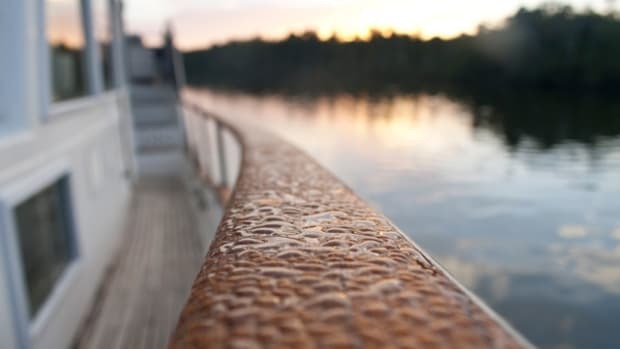 While moving around your boat—whether washing her down, backing off a diesel fill, or handling lines—you’ll often come across a little something else that needs doing. 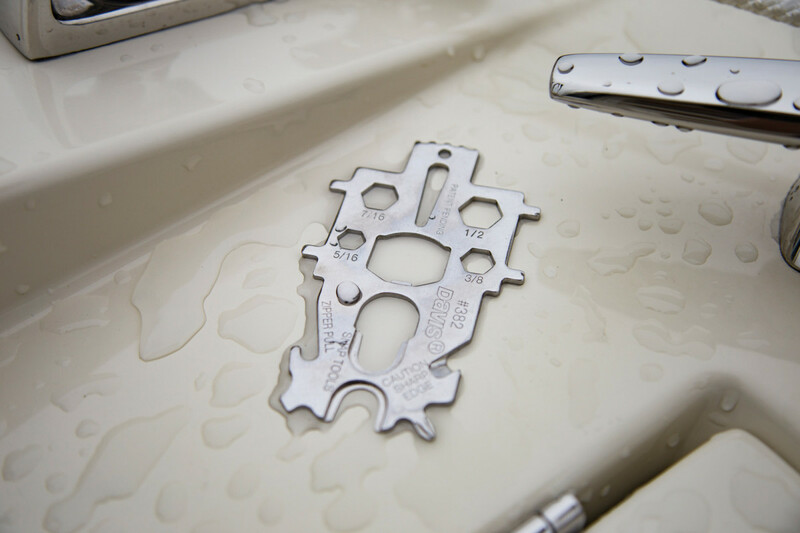 That’s when the Snap Tool Multi-Key comes in handy, with its variety of deckplate keys, wrenches, zipper hook—even a bottle opener aptly designated “Five O’Clock.” Hey, my pocketknife seldom covers all the bases, but this baby does. —B.P. 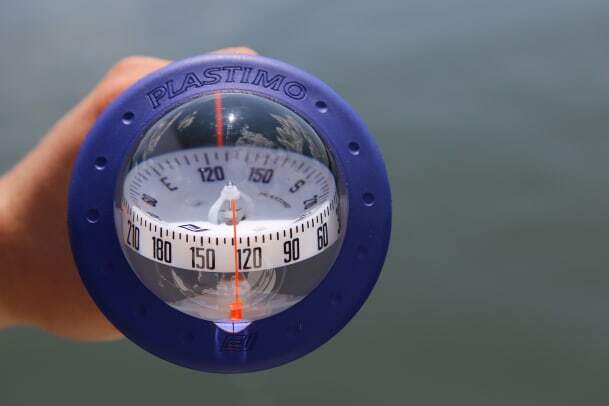 If you’re into paper charts, dividers, and taking the occasional bearing just to keep tabs on your electronics, check out the IRIS 100 hand-bearing compass from Plastimo. Want to use it as a mounted device? There’s a small plastic bracket you can install anywhere. Or remove it from the bracket and shoot a bearing on a lighthouse or point of land. The conical card is easy to read directly or horizontally. —B.P. Intern Carly Sisson (pictured above) found herself testing the versatile Airis Sport Inflatable Kayak from Walker Bay. 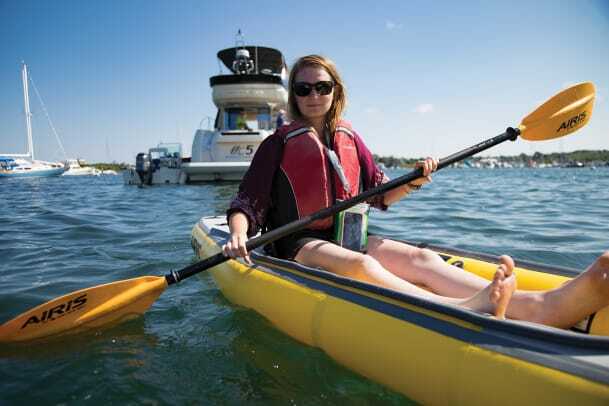 Some things she liked: “The cool thing about this kayak is it only weighs 20 pounds,” Carly says, “and it folds up into a backpack so it’s very easy to transfer onto your boat.” Also, bungee tie-downs are great for transporting gear, and an oversized rear skeg offers solid tracking performance. —S.M. 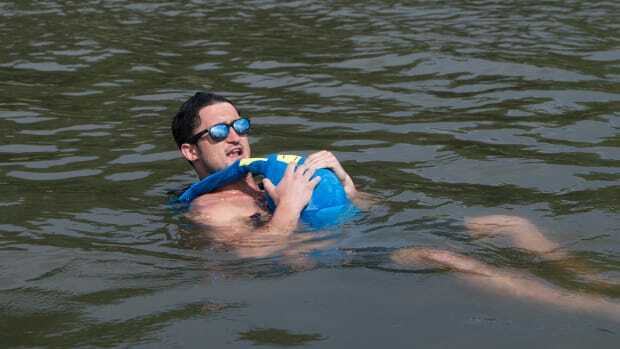 Editor&apos;s Note: images and video show the Airis Sport Inflatable Kayak with fabric backrest not attached. 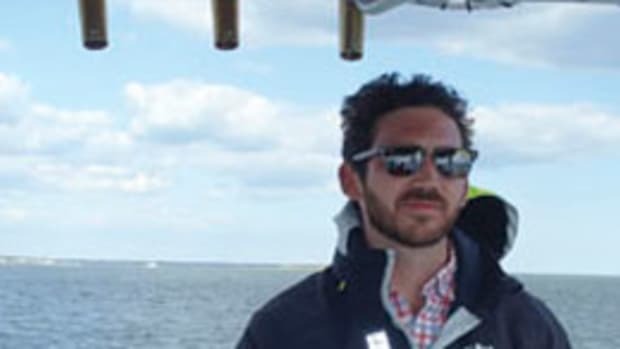 We always say play to your strengths and summer on the water in New England lends itself to getting in touch with your preppy side. A comfortable blue gingham cotton button-down and chinos go from boat to beach-house lawn party and out on the town without missing a beat. A colorful sport-correct belt and Maui Jim Kipahulu shades with bronze lenses complete the cohesive look. —J.Y.W. The great thing about the new HX 15 x 56 binoculars from Steiner is the clarity they offer at great distances. 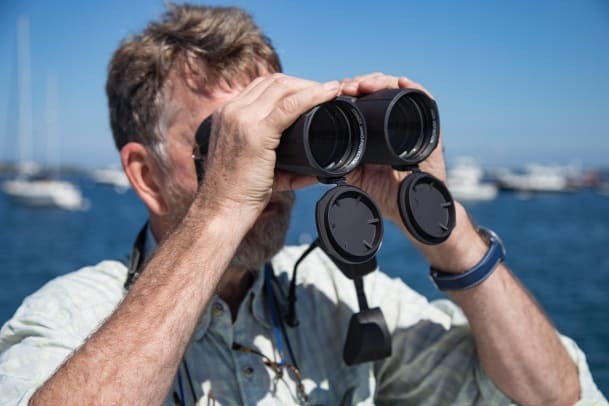 By comparison, glasses with the 7 x 50 configuration (more typical for the marine realm) have considerably more magnification and larger objective lenses for better light-gathering at dusk or after dark. Because of this extra firepower the Steiners are heavy, however; I had to stabilize them by resting my elbows on my knees while focusing.—B.P. 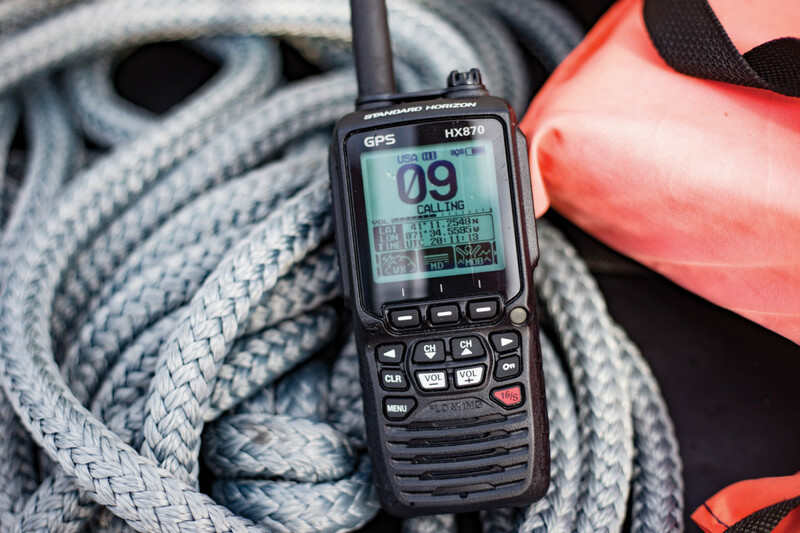 Nothing builds confidence like a good backup, and that is just what this floating, IPX-8 submersible VHF provides in spades. 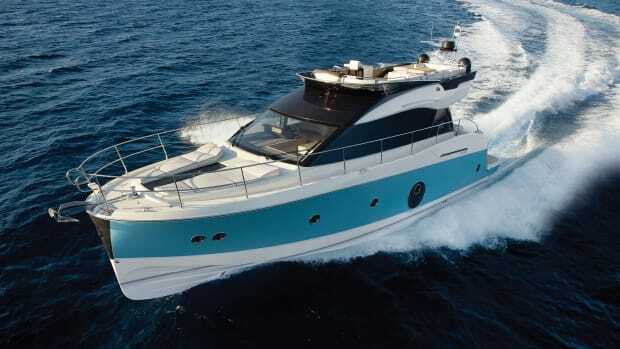 This is an all-in-one heldheld that provides boat-to-boat communications as well as position information, and since it’s equipped with Class D DSC it makes a distress call with one touch of a button. Icon-labeled soft keys let the user access all functions quickly and easily. —J.Y.W. 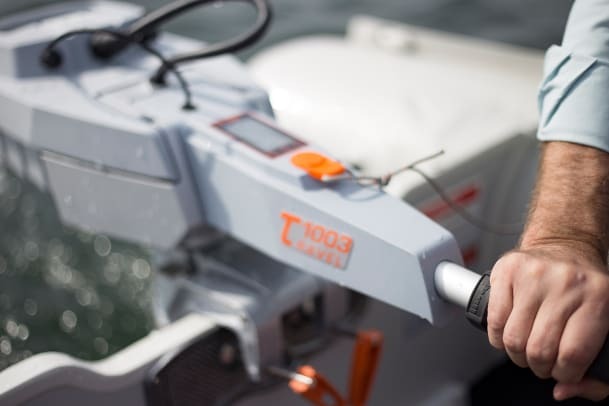 The 3-horsepower Travel 1003 S (for short shaft) from Torqeedo is a fabulous little electric outboard that’s both environmentally friendly (zero emissions) and eminently practical. 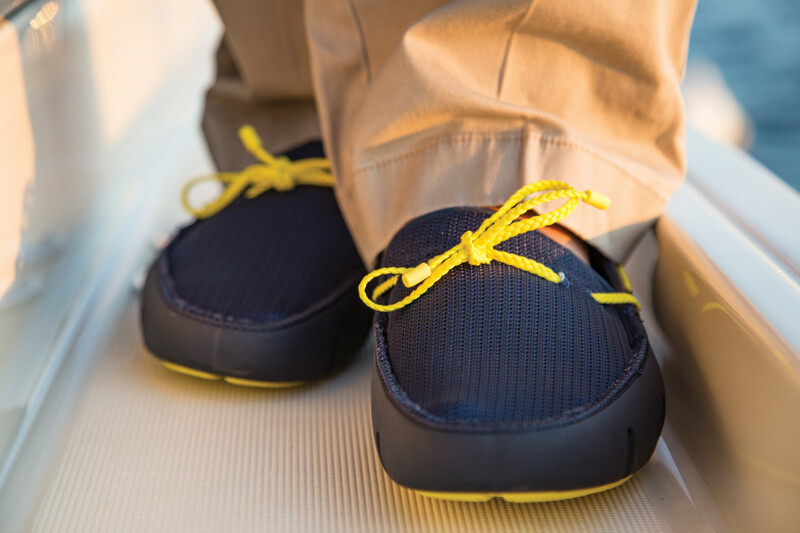 Because it’s composed of three lightweight parts that can be easily assembled after you’ve brought them aboard, there’s no struggling to mount the Travel 1003 S on the transom of your dinghy; and, even better, running is darn near silent. —B.P. 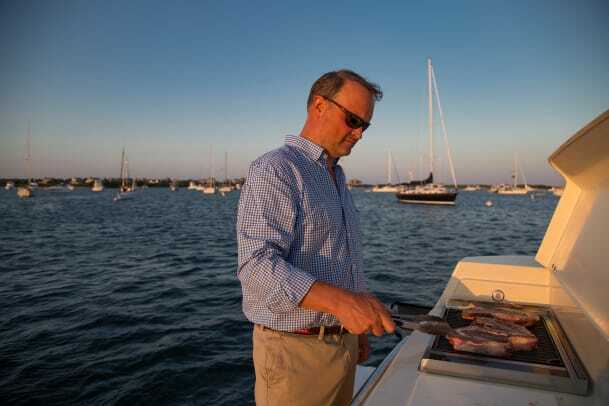 Appropriately named, the Flybridge shirt from Grundéns is water- and stain-resistant, lightweight and breathable, making it ideal for a long summer cruise. 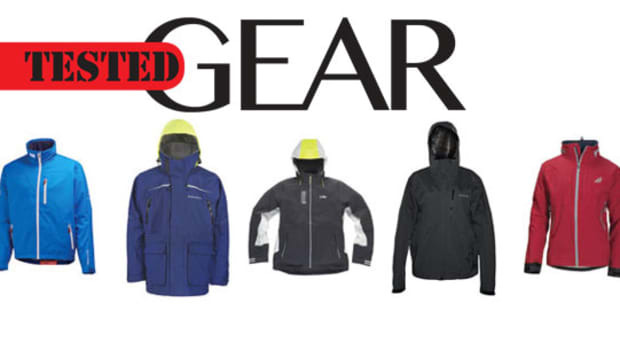 On a cool morning, like the one we had when cruising to Sag Harbor, New York, the H2Flow jacket is that rare combination of warm and breathable. 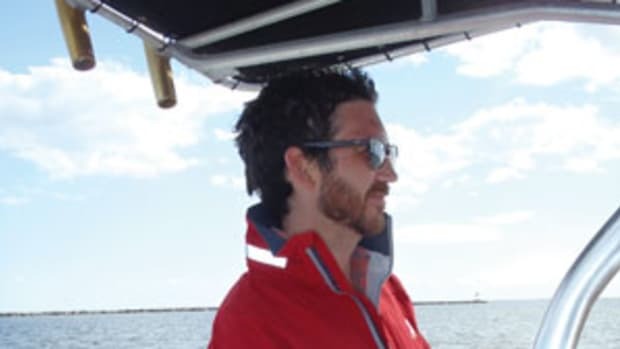 Fleece-lined pockets are a nice touch for when the weather turns south. 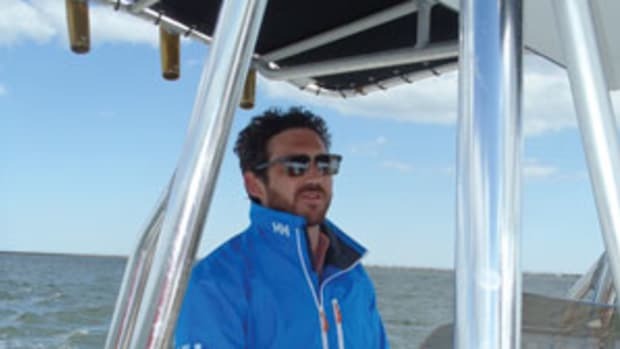 Wiley X sunglasses cut down on glare when underway or on the dock. —D.H. The first item I called dibs on when packing for our gear test was this Sea to Summit duffle because I was, well, packing. I’m a fan of drybags in general, but the fact that most are toploading makes finding anything quickly a chore. The wide opening flap on the 11-by-11-by-26-inch bag lets you access everything easily. 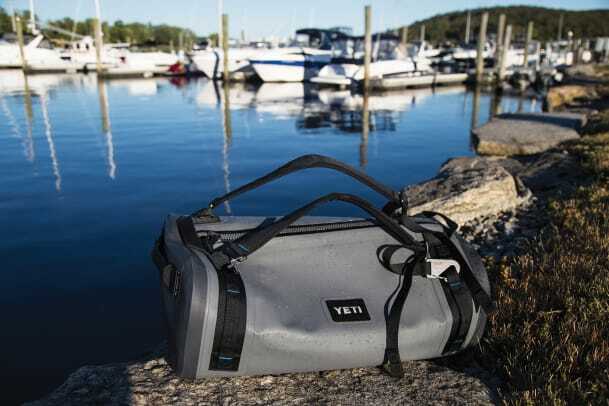 Versatile straps let you carry the bag in your hand like a briefcase or on your back like a backpack—a nice option when hauling provisions back to the boat. —D.H. Did you hear? It’s a great time to be a cooler aficionado. Many brands are taking the art of marketing rotational-molded ice preservation to unforeseen levels. 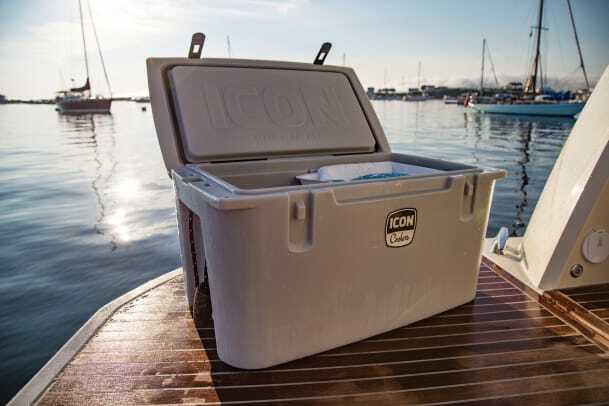 With ICON, the effort shows in the products, and comes from a made-in-the-USA ethos and true innovation. Sturdy enough to use as a casting platform, our demo had a teak-colored SeaDek top ($100) and cork handles ($20). 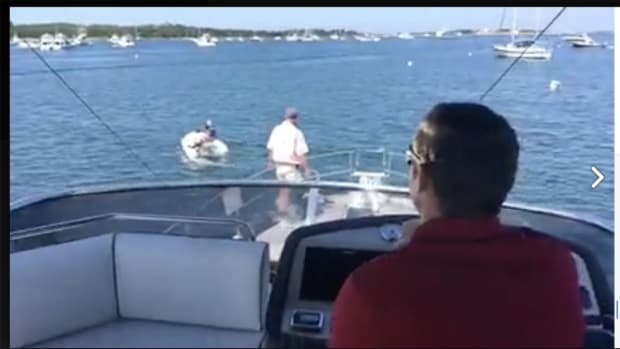 But the big surprise was a prototype of the company’s dry-ice delivery system, which may change the game for owners of any brand of high-end cooler. —J.Y.W. 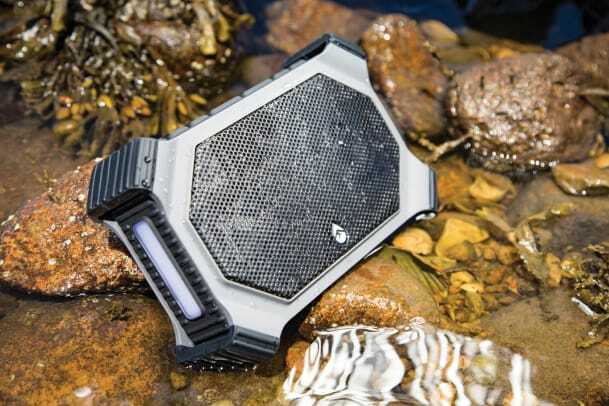 What’s not to love about Ecoxgear’s rugged, 20-watt speaker? 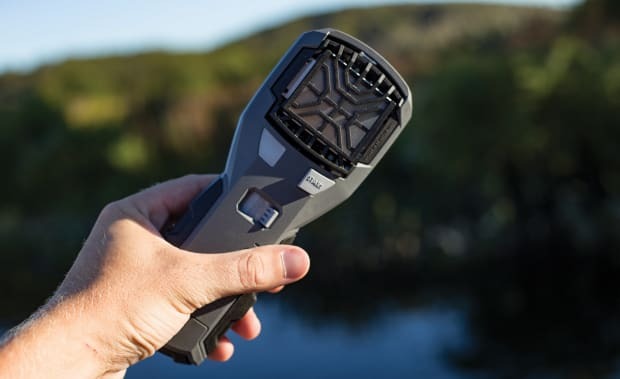 We put this through the wringer and learned that it’s waterproof (it even floats), its range exceeds 100 feet with Bluetooth ­connectivity, and you can answer calls with a built-in speakerphone. (OK, that last one was a little annoying.) However, we’d still like to try ­EcoConnect, which enables the pairing of two EcoSlates for stereo surround sound! —S.M. Every good boatyard needs a very good boy. 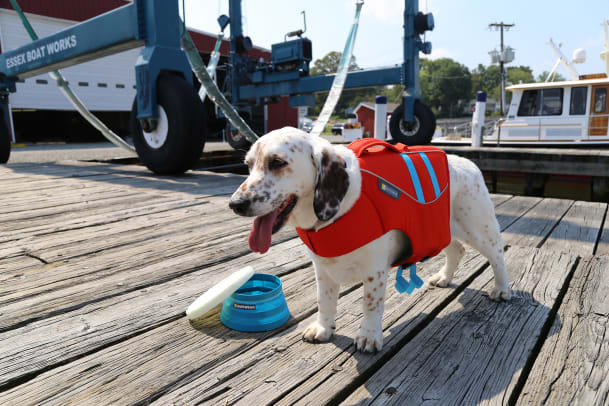 If you work for treats like Charlie does, the dog days of summer don’t seem that long—what with a canine life jacket that conforms to a dog’s natural swimming position so you can hit the water. Throw in a toy that floats and glows in the dark, and a collapsible bowl? Your tail starts wagging immediately!—S.M.